Twitter is addicting and probably you are addicted to Twitter? With rising popularity, Twitter addictions in become increasingly common and there are high chances you are also a Twitter addict. Twitter is the popular micro blogging platform which allows you to send messages (tweets) to your friends, relatives and followers.You can send tweets to your followers with text upto 140 characters. As Twitter has got really popular, there are people spending all day over twitter with signs of twitter addiction. Get excited when some one follows you on Twitter. Feel the end of the world when twitter gets an outage. Send @ and RT in messages to your friends in emails. Beg your blog readers to follow you on twitter, then beg your Twitter followers to Retweet the tweet. Post more tweets than blog posts, and turn from full time blogger to full time tweeter. Spend all day on twitter giving yourself the excuse that you are doing great service to your followers, and bunk going to office. 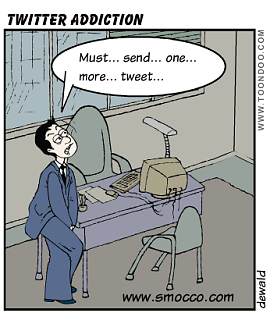 Tweet on Twitter more than doingoffice work. Keep searching for your twitter nameand your tweets in real time twitter search. Keep refreshing the twitter page every second for new tweets. Print your twitter id on business cards. Set Twitter as your browser home page. Add notice in front of office door – “I am on Twitter, Dont disturb”. Use more than 5 twitter clients. Add your twitter name to Google alerts to know what others are speaking about you. Blog more about twitter applications. Use Twoogle to search in Google and Twitter. Keep urging your family members to get a twitter account. Introduce yourself to new persons more as a tweeter than as a businessman. Go crazy about twitter and advertise on news papers, TV and distribute pamphlets to follow you on twitter. Ask your bosses wife to follow you on twitter! Add your twitter id to the nameplate of your house. Keep sending SMS to all your friends to follow you on twitter. Ask questions about Twitter rather than job related queries during interviews. Only wear dresses with twitter logos.